State Sen. Daniel Biss (D-Evanston). Biss slammed fellow gubernatorial candidate J.B. Pritzker at a forum on Tuesday. Illinois Democratic gubernatorial candidates’ first collective foray into the public eye was marked by infighting and spirited debate on issues ranging from legalizing marijuana to tax breaks for large businesses. The event, broadcast and held at NBC Tower on Tuesday, was sponsored by the station and Telemundo Chicago, and held in partnership with the Chicago Urban League and the Union League Club of Chicago. The forum featured the six main Democratic candidates for governor: businessman J.B. Pritzker, businessman Chris Kennedy, State Sen. Daniel Biss (D-Evanston), Madison County school superintendent Bob Daiber, 2014 gubernatorial candidate Tio Hardiman and doctor Robert Marshall. Biss and Kennedy, who have emerged alongside frontrunner Pritzker as the prominent challengers in the race, slammed the wealthy businessman for his ties to State House Speaker Mike Madigan and Cook County assessor Joe Berrios. Biss said beating Gov. Bruce Rauner should be the Democratic party’s priority, and that worst case scenario would be Pritzker — a billionaire like Rauner — winning the primary. Pritzker challenged Biss’s relationship with Madigan, saying the state senator voted to appoint him House speaker, an assertion that quickly saw the forum devolve into a shouting match. Kennedy, joining the fray, said he thought Pritzker has emerged as “the poster child for pay-to-play politics in the state.” Pritzker is pushing politics toward a darker future, he said. When asked his stance on legalizing recreational marijuana, Kennedy said he supported it as long as the legalization process is clear. He said he’d like an impartial third party, like the University of Illinois, to draft the legislation. Biss — who received the Democratic Party of Evanston’s endorsement on Sunday — also said he supported legalizing recreational marijuana, as it is “a racial justice issue.” He argued that the state cannot continue to perpetuate a system that locks up people for drug-related crimes at rates disproportionate by race. 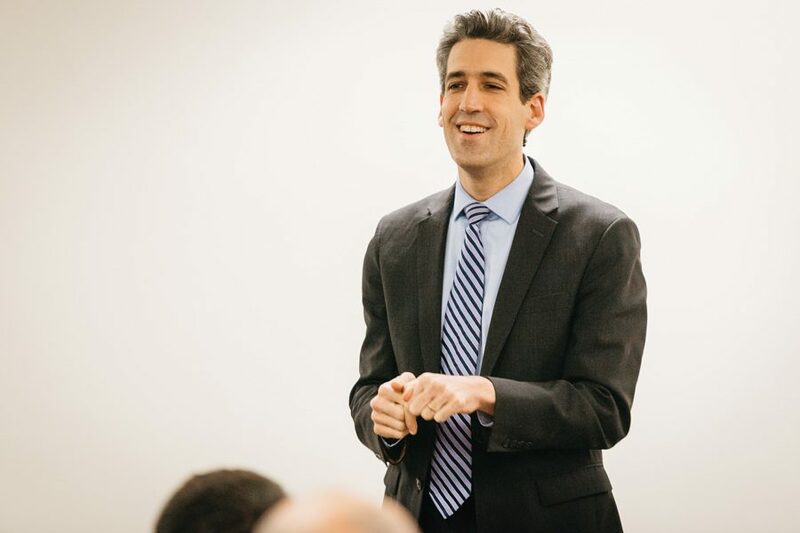 “That revenue that we obtain by taxing it ought to be put largely into public health programs because we ought to be treating drug addiction as a public health problem,” Biss said. The candidates also discussed Amazon’s bid to build its new headquarters in Chicago. Pritzker said the state needs to ensure there is a return on investment for taxpayers in Illinois and that benefits from the deal would be spread across the state. The proposal could add up to 50,000 jobs to the state economy, according to the Chicago Tribune. The candidates did come together on the issue of immigration — all six said they would risk federal funding to retain Illinois’ status as a sanctuary state. The Democratic primary is set for March 20. The general election is slated for Nov. 6.